Persistence Market Research delivers yet another unbiased, comprehensive and insightful report titled ‘Mobile Value Added Service Market: Global Industry Analysis (2012-2016) and Forecast (2017-2022)’. 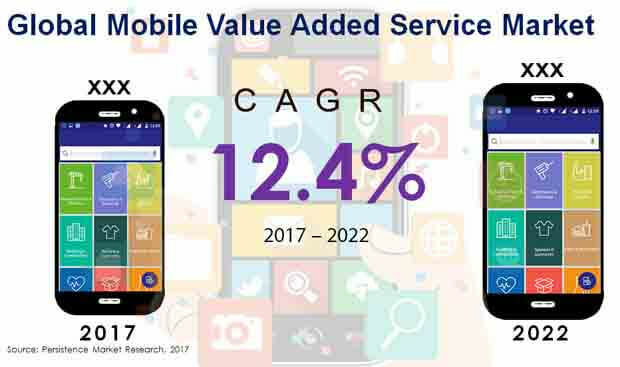 In this report, the global mobile value added service market is explored in great detail, and the market dynamics of the global mobile value added service market has been covered comprehensively, explaining to the report readers the drivers, restraints and trends operating in this highly competitive market. Also, analysis of the data over different parameters has been done in order to arrive at market numbers concerning the global mobile value added service market. Besides, competition landscape of the global mobile value added service market is also covered in this report, giving information about the key companies operating in the global mobile value added service market. In the first part of the report, the executive summary and the introduction are given. The executive summary gives a summary of the global mobile value added service market and gives the pertinent market numbers that are most significant, which include the historical CAGR growth from 2012 till 2016 and the forecasted CAGR from the year 2017 till the end of the forecast period in the year 2022. Information about lucrative markets from the point of view of leading revenue share and highest CAGR are also given in the executive summary. In the introduction section, the mobile value added service market is defined in detail so that the report readers are clear about the scope of this market. The next section of the report gives information on the key dynamics of the mobile value added service market. Key points covered in this section include the global economy, fiscal stimulus and bottom line of enterprises. In the subsequent section of the report, information is given on the cost structure analysis and pricing analysis of the global mobile value added service market. An analysis on the market presence of key participants (intensity map) is also offered in this section. The next part of the report consists of the global mobile value added service market analysis and forecast by platform, end-user, application and region. This section of the report contains important market numbers in the form of year-on-year growth comparison, market share comparison and revenue comparison. The global mobile value added service market is also analyzed across key regions- North America, Latin America, Europe, Japan, APEJ and MEA. The last section of the report contains the competition landscape, where leading market players operating in the global mobile value added service market are profiled in detail. This information is in the form of company overview, product overview, key financials and key developments pertaining to that particular company. The competition landscape also features the SWOT analysis of the selected companies, which gives the report readers information about the strengths, weaknesses, opportunities and the threats that such companies operating in the global mobile value added service market are facing. The competition landscape is an invaluable part of the report as it contains all the necessary information to study the leading companies operating in the global mobile value added service market and how they implement their strategies and vision to stay in the pole position in this highly competitive market. Persistence Market Research leverages a proven and tested research methodology to determine the revenue estimations of the global mobile value added service market. In-depth secondary research is used to arrive at the overall market size and top industry players. A list of industry players (manufacturers), distributors, retailers, and industry experts is developed along with a comprehensive discussion guide for detailed and exhaustive primary interviews. Data thus obtained is validated using the triangulation method, where primary and secondary research along with Persistence Market Research analysis contribute to the final data. This data is then scrutinized using advanced tools to glean pertinent insights into the global mobile value added service market. The global mobile value added service market is growing at a brisk pace due to the rapid usage and increasing penetration of smartphones. The demand for value added services is growing in the users of mobile phones who have a great need for connectivity and portability. Mobile phones are not only used for making calls and they have turned into multipurpose devices that can enable the users to access apps, read the news, web surfing, checking e-mails and social media interaction. As the world is moving towards faster telecommunication services and high rate of internet penetration, the market for mobile value added services is bound to increase. One of the latest trends in the arena of mobile value added services is the emergence of location-enabled mobile value added services. With the help of location based services, consumers can get real-time directions to locations they want to explore, they can also avail weather forecasts and updates on traffic right from their mobile devices. Such type of location based services are also used by advertisers to generate notifications when the consumer is in the vicinity of their shop and they can instantly give an offer on shopping to such location specific customers. This is just one of the facets of mobile value added services and such kind of services have vast areas of application. According to the assessment of Persistence Market Research, the global mobile value added service market is forecasted to reach a figure of about US$ 698,900 Mn in 2022 and is poised to exhibit a robust CAGR in the period of assessment. The market in North America is set to dominate the global mobile value added service market in terms of value and this trend is projected to sustain itself throughout the assessment period. North America mobile value added service market is the most attractive market, growing at a robust CAGR over the forecast period. According to the projections of Persistence Market Research, the short message service segment is expected to reach a value of about US$ 159,300 Mn in the year 2022. This signifies a robust CAGR during the forecast period of 2017-2022. The short message service segment is estimated to account for more than one-fourth of the revenue share of the platform segment by the end of the year 2017 and is expected to lose in market share by 2022 over 2017. According to the assessment of Persistence Market Research, the consumer end user segment is poised to touch a figure of about US$ 269,500 Mn in the year 2022. This signifies a CAGR of nearly 9% during the assessment period from 2017 till the year 2022. The consumer end user segment is estimated to account for nearly half of the revenue share of the end user segment by the end of the year 2017 and is projected to lose market share by 2022 over 2017. The report also profiles companies that are expected to remain active in the expansion of global mobile value added service market through 2022, which include AT&T Inc., Apple Inc., Alphabet, Inc., Blackberry Limited, Samsung Electronics Co Ltd., Sprint Corporation, Vodafone Group Plc, Tech Mahindra Limited, ZTE Corporation and OnMobile Global Limited.